The Yagi–Uda antenna (usually referred to as a Yagi), is a relatively simple to construct multielement structure consisting of a combination of driven (director) and reflective (reflector) diploes. Careful phasing of the configuration results in a directional radiation pattern that is use often for long distance (DX) and direction finding work. It is also useful in a dense signal environment where there is a need to exclude received signals not emanating from a preferred source. Common (or what used to be) rooftop television antennas were of the Yagi type and served not just to pull in distant stations, but to help reject multipath signals that would cause ghost images on the screen. The concept is the 1926 brainchild of Messrs. Shintaro Uda and Hidetsugu Yagi, both of the Tohoku Imperial University, in Japan. Fig. 1. Over-all view of the author's home­built Yagi antenna designed for the fringe area reception of Channel 5, Syracuse. Director tuning stubs are clearly visible. Construction details for building your own fringe area antenna. Although designed for Channel 5, data is included to cover any of the v.h.f. TV channels. Kingston, Ontario is 75 miles north of Syracuse, N. Y. With a booster and high-gain antenna, reasonably good pictures can be obtained from WSYR, Channel 5, and WHEN, Chanel 8, even during the poor winter months. However, good antenna installations are costly; mounted on a 20 ft. roof-top mast, one single-channel Yagi costs about $60.00, while two, one for each channel, run at $90.00. Homemade installations can be completed for from $10.00 to $15.00. It was the author's chore to design Channel 5 antenna for a friend who intended to construct it himself. The results of our joint efforts were highly successful from the performance as well as the constructional point of view. The pictures obtained are equal to, and in some cases better than, those obtained from several commercial installations. The finished product weathered a recent bad sleet storm intact, while many other antennas in the vicinity were badly damaged. Readers living in fringe areas who intend to build their own Yagis should be able to benefit from some or all the ideas that were worked out for this design. Deciding on the type of antenna to be used was the first problem. Lack of space ruled out the highly desirable rhombic design.1 A horn type2 was mighty attractive, especially because of the very high gain on Channel 8 as well as the adequate gain on Channel 5, but the structure was to be mounted on a small bungalow and, from the purely aesthetic point of view, its size precluded its use. Five-element Yagis and stacked conicals with reflectors have proven themselves in this area, and our choice boiled down to either one of these types. The Yagi was finally selected - for two reasons: robust construction is much more easily achieved, and the experience of others suggested that this type picked up less noise. The design of the Yagi turned out to be a very complex matter. Two ready-made designs were available, one for single channels, the other for reception of both Channels 4 and 5.3,4 We were looking for something more robust than the former, and a previously-constructed model of the latter had been found to set up substantial amounts of standing waves in the feedline when Channel 5 was being received - probably due to a lack of preciseness in the wiring of the rather critical feed arrangement. A third article was consulted but constructional details were lacking.5 The "Radio Amateurs' Handbook" contained much helpful information but did not delve too deeply into the problem of the five-element Yagi. Fig. 2. 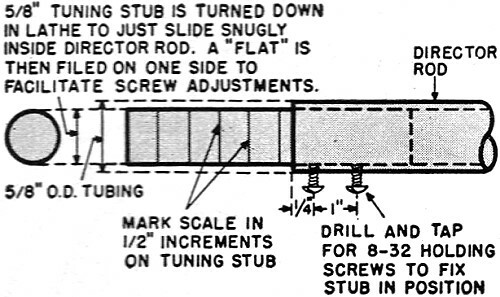 Construction details on the tuning stubs shown in over-all diagram (Fig. 4). Fig. 3. 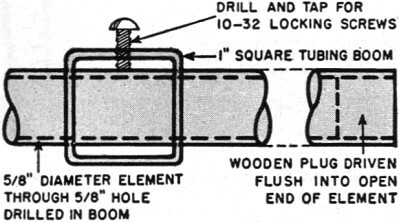 Method of fastening antenna elements to 1" square #61ST alloy tubing. At this point we were somewhat discouraged by something we could not then comprehend. There was a seemingly serious discrepancy from article to article on the feed point resistance of the Yagi antenna. The "Handbook" stressed that the resistance of the dipole was substantially reduced by the addition of parasitic elements. Yet some of the other articles were claiming figures of 200 to 300 ohms for five-element folded dipole arrays. 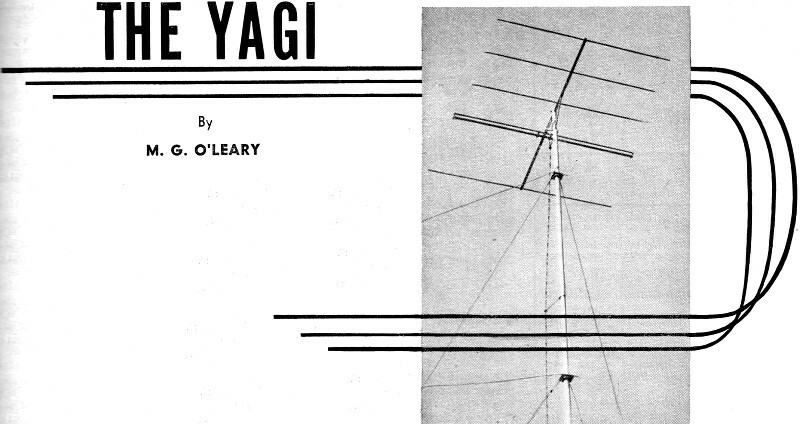 Luckily, an issue of "QST" was at hand with two excellent articles on Yagi design.6,7 From these it was learned that reflector and director spacings and lengths had significant effects on the antenna feedpoint resistance, bandwidth, front-to-back ratio, "Q," and dipole resonant frequency. While the information given covered only two- and three-element arrays, it was decided to use it as the basis for a five-element design. However, it was apparent that there were many pitfalls in designing a multi-element antenna without laboratory test equipment. Thus we decided that our antenna would be one that could be easily adjusted to peak performance. Reference (6) used graphs to show how director lengths and director-dipole spacings (with a director-reflector spacing constant at 0.3 wavelength) affect bandwidth, feedpoint resistance, and "Q" of a three-element Yagi. If these graphs are studied, it is apparent that an adjustable director length can only vary all these values over wide limits if the director-dipole spacing is fixed at 0.1 wavelength. (The dipole-reflector spacing is then 0.2 wavelength.) For our purposes we assumed - guessed may be a better description - that two additional directors would have the same effect, to a lesser extent, as the one director. At any rate we fixed our director-dipole and reflector-dipole spacings at 0.1 and approximately 0.2 wavelength respectively, and estimated that if all director lengths were adjustable, we would have adequate control. Reference (7) shows by graphs how varying the director or reflector lengths will change the dipole resonant frequency and it thus seemed desirable to incorporate a length adjustment in the dipole. 1. A three-conductor folded dipole to raise the feed point resistance sufficiently so that it could be adjusted to around 300 ohms, thus properly matching 300-ohm lead-in ribbon. 2. A dipole of variable length. 3.A 0.53 wavelength long reflector spaced approximately 0.2 wavelength from the dipole. 4. Three directors, all spaced 0.1 wavelength, and all adjustable in length. 5. An easily adjusted open quarter-wave matching stub at the dipole feedpoint. This will be discussed later. For ruggedness, 5/8" dia. 24ST tubing was used throughout. 61ST alloy should be a satisfactory substitute, but it is recommended that such alloys as 24S.0, 61SW, 61S0, 2S, and 3S be avoided unless the wall thicknesses are very heavy. 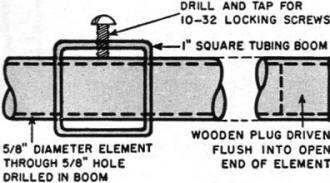 The boom was made from 61ST 1" square tubing. 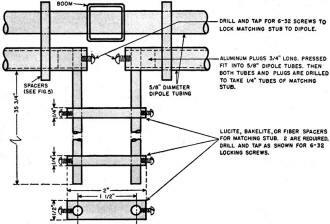 Round tubing can certainly be used for the boom, but the "squaring-up" will be much more difficult. Fig. 4. Dimensions for the Channel 5 Yagi. Figures are given for the element lengths with and without matching and tuning stubs. See Table 1 for other channel dimensions. For this 122 ratio K is taken from the graph to be 0.93. This value is used in determining the physical length of the 0.53 wavelength reflector. K for the dipole is less than 0.93 due to the three closely-spaced conductors, but the actual value is difficult to obtain. Since, for tuning, it is desirable to have the dipole slightly on the long side, 0.93 was used for K in the length calculations. Spacings between the. various elements are found with K = 1. Since this antenna was built and found to be an excellent one, two additional books have been consulted: "TV and Other Receiving Antennas"8 and the 1952 edition of the "Radio Amateurs' Handbook." The value of K for 5/8" tubing at 77.25 mc. has been checked in each: in the former it turned out to be 0.90; in the latter, 0.965. This demonstrates just how opinion varies on this matter. Our value of 0.93 is at least a very good average - and it works. Again, this disagreement is another excellent argument for the tunable antenna. The directors should be adjustable from 0.4 to 0.48 wavelength (for 5/8" tubing). They were, accordingly, made to the dimensions shown - which will allow plenty of leeway in adjusting the 8" long stubs. Fig. 2 details these stubs. They should be calibrated in half-inches along their length for precise balancing of the director lengths on each side of the center boom. All elements are mounted on the boom through 5/8" holes drilled through the 1" square tubing. 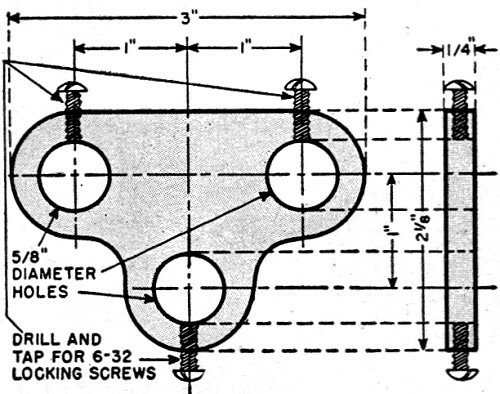 After each element is centered exactly, it is fixed by tightening the holding screws as shown in Fig. 3. Wooden plugs are fitted into the ends of all the open tubes to lessen wind resistance. Fig. 5 illustrates the spacing device for the dipole conductors. The outer ones are made of aluminum alloy and are used for adjusting the effective length of the dipole. The inner ones can be made from lucite, bakelite, or red fiber, and are locked into position very near to the center feedpoint. Table 1. 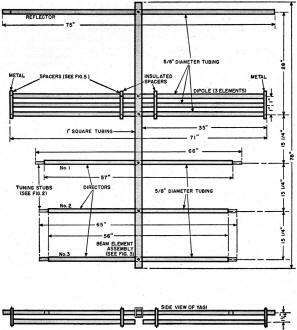 Antenna element dimensions computed-for all of the v.h.f. television channels. Fig. 6 shows the center connections of the dipole. A word of explanation here may be appropriate. Ideally, the feedpoint resistance of the antenna should equal the surge impedance of the feedline: 300 ohms for 300-ohm line. For many antenna designs the feedpoint resistance is lower than the line impedance. This mismatch can be remedied by a commonly recommended device, a quarter-wave, open-end matching stub. This can be made up of a quarter-wavelength of 300- ohm line attached to the antenna feedpoint. The 300-ohm line is then attached to the point along the length of this stub that gives the best match (or best picture). Such a matching stub was desired on our antenna in case the tuning adjustments for the best picture lowered the resistance appreciably below 300 ohms. If one tries to picture oneself adjusting a matching stub of 300-ohm ribbon twin-lead, while experimenting with dipole and director length adjustments, it will soon be realized that some much more simple arrangement is desirable. Fig. 10-14 in the 1948 "Handbook" shows that 14" dia. tubing spaced 1 1/2" apart has a line impedance of 300 ohms. Accordingly, the 300-ohm matching stub was made of 1/4" tubing spaced with bakelite or Lucite spacers. For Channel 5 each piece was 35 3/4" long. 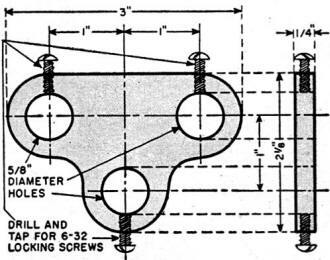 The length factor K must again be used and, for 1/4" tubing at 77.25 mc., the 1948 "Handbook" gives this value as 0.945. Battery clips attached to the feedline can now be adjusted quickly up and down the stub for optimum positioning. Fig. 1 shows the completed and adjusted antenna mounted on a 2" diameter mast 20 feet high. 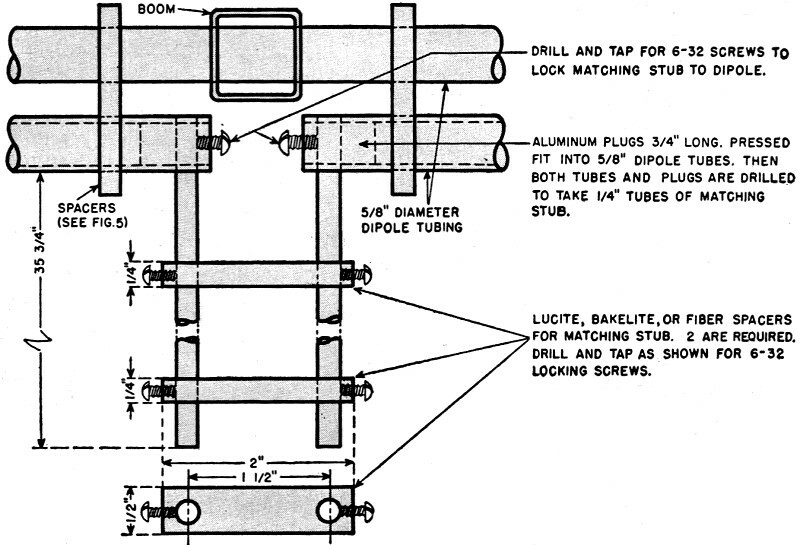 The 1" square boom was mounted in a 1" slot cut into the top of the pole. It was fastened with a 1/4" carriage bolt and then squared up with two aluminum shelf brackets of the common variety. The matching stub is not visible as it was found, after optimum adjustments had been completed, that the best position of the feedline was the extreme lower end of the stub. This indicated that the antenna matched the 300-ohm line very closely and thus the stub was not necessary. Fig. 5. Details of the dipole spacer units. Four of these units are required - two of aluminum and two of either Lucite, fiber, or bakelite. See Fig. 4 for positioning. Fig. 6. How the matching stubs are attached to the dipole of the author's antenna. A very laborious tuning procedure can be worked out including all the possible combinations of adjustments if one desires to get the very last ounce of picture out of this antenna. However, experience has taught that the owners of new television sets insist on watching the pictures and thus, a shorter and less precise procedure was, of necessity, followed. Yet, sufficient experimentation was carried out to insure that almost optimum, if not optimum, results were obtained. Most of the adjustments were made with the antenna temporarily mounted on the 20-foot mast and the mast resting on the front lawn leaning against a verandah column. We were able to get a picture with the array set up in the bungalow's living room and some of the preliminary adjustments were made there. For each set of director length adjustments, the dipole length was varied by sliding the outer spacers in and out. Then the battery clips were adjusted along the length of the matching stub for best results. Observations were based on picture clarity, contrast (lack of snow in this fringe area during February), and quality of the audio. The best settings were finally rechecked before a final setting was made. After final adjustment, several sets were tried out. It was interesting to watch the surprised looks of some of the installation technicians when they found they could not change the picture quality by grasping the lead-in line. We received many compliments on the installation. Just back of the house is a main thoroughfare, but buses, transports, etc. do not disturb the picture or the sound. The antenna bandwidth is good. The test pattern comes through perfectly to the screen with absolute clarity on all the vertical stripes. Incidentally, for those who wish to make a Channel 5 antenna without tuning attachments, the final dipole length was 71", and the lengths of the directors 66", 65", 65" in respective order of distance from the dipole. These Channel 5 dimensions have been transposed for the other channels in Table 1. 5/8" If dia. tubing is used for all channels, but the change in K factor due to changes in the wavelength-diameter ratio is taken into consideration in the figures. The 1948 "Handbook" does not give values of K for 5/8" tubing at high-band frequencies. Since we are dealing with relative values at the different frequencies, we did not worry too much about which of the other two sources of K values we used. All values for the transposing calculations were taken from "TV and Other Receiving Antennas." However, for those who really desire superior results, it is suggested that the small extra effort put into a tunable antenna is well worthwhile. 1. 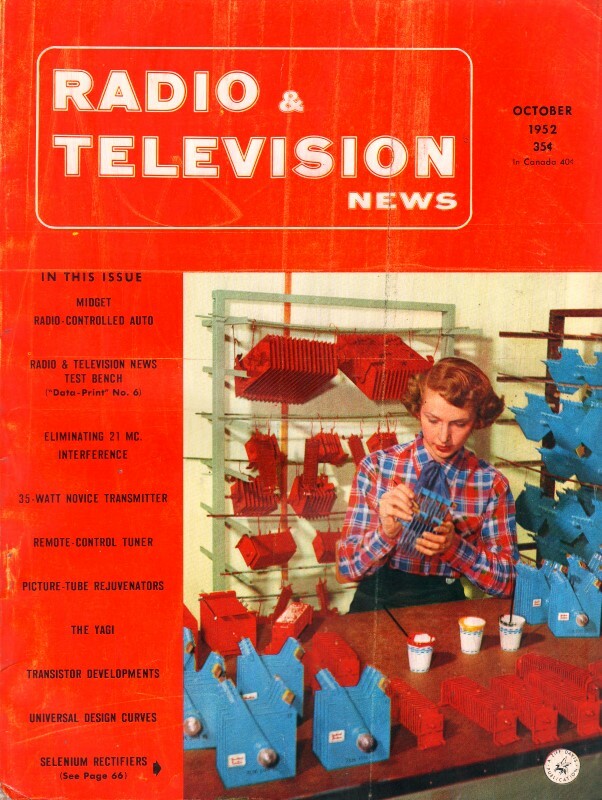 Smith, Woodrow; "Rhombic Antennas for Television," Radio & Television News, October, 1949. 2. Morgan, Dean 0.; "Horn Antennas for Television," Electronics, October, 1951. 3. Greenlee, Lyman E.; "High-Gain Directional Array for Marginal TV Reception," Radio & Television News, August, 1949. 4. 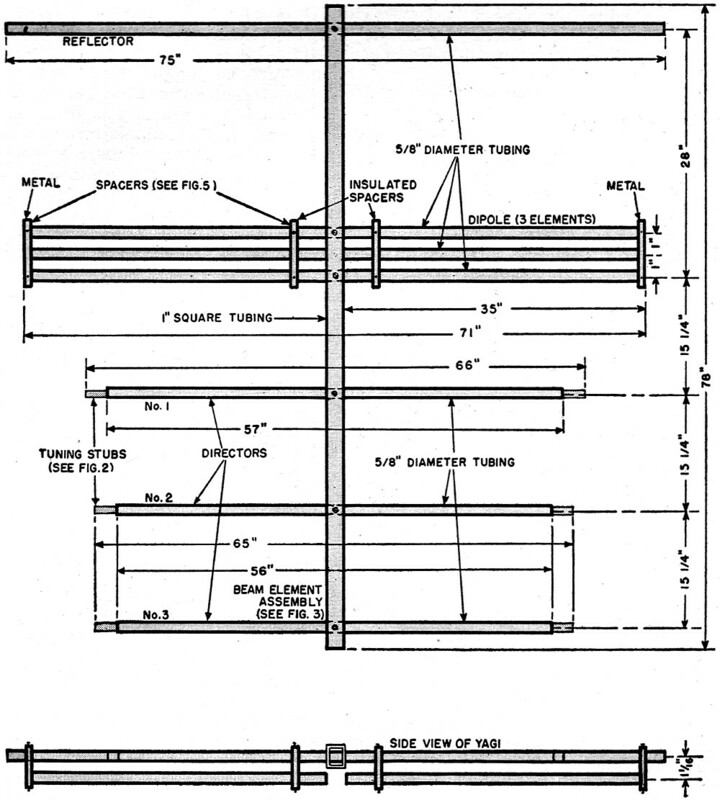 Carmichael, G. N.; "Two-Channel TV Yagi Design," Radio & Television News, October, 1950. 5. 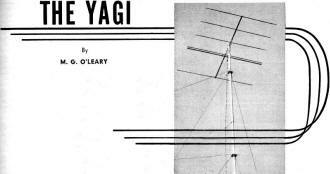 Harris, Harold; "The Yagi Antenna," Radio & Television News, October, 1951. 6. Shanklin, J. P.; "Bandwidth of Two and Three-Element Yagi Antennas," QST, October, 1950. 7. Dukat, F. M.; "Driven Element Length," QST, October, 1950. 8. Bailey, Arnold B.; "TV and Other Receiving Antennas," John F. Rider Publisher Inc., pages 318, 319.